Coup de Tête is a collaboration between west coast Hat Maker Jay Mitchell and Toronto Leather Smith Ryan Tavares. The company focuses on one of a kind, handmade pieces that are made entirely in-house and built to last a lifetime. With the use of traditional techniques these two bring timeless styles into the future by incorporating modern, avant garde sensibilities to create wears as unique as their owners. While primarily a bespoke house, Coup de Tête offers a series of small batch collections throughout the year, where they use only full grain vegetable tanned leather. Although these goods are cut together each piece is unique from the raw hide edge cuts, custom dye colours and hand stitched patterns. 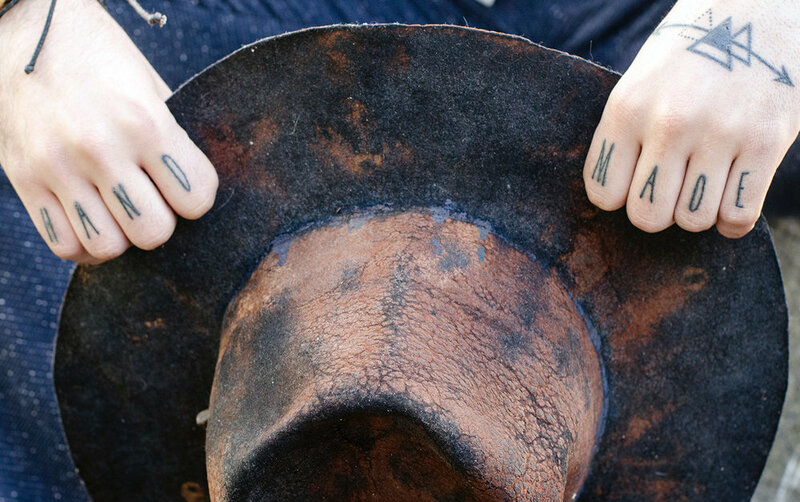 When you buy Coup de Tête you are buying a piece that is handmade with character, from hand-stitched leather with hammered copper rivets to fur felt fedoras custom tailored for you. These products will age better than their owners. You only live once, you should only have to buy once.